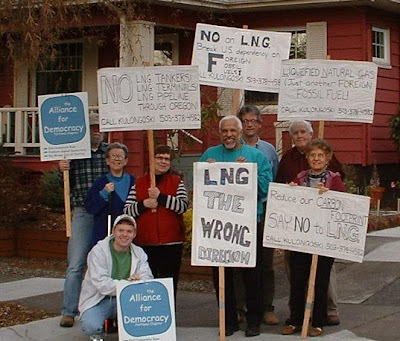 AfD Portland chapter members express their desire not to have LNG terminals built on the Columbia River. Three proposals are being entertained. Our chapter opposes them because of the negative environmental consequences, because they would continue our dependence on fossil fuel, foreign fossil fuels at that, and because it is part of the corporate agenda to undermine public efforts toward sustainable green energy alternatives. Way to slap corporate greed in the face! I hope it works.